Great all we need is one more thing to watch out for in our diet! It’s not an all or nothing proposition unless you suffer from auto-immune diseases. As in many of the more prevalent diseases today they come from leaky gut. If you are already leaning towards a more Paleo diet you will be fine. As always the quality of your food is of utmost importance. So what are lectins? Lectins are sugar-binding plant proteins that attach to your cell membranes. They are a form of protein found in all kinds of plants and animal foods, which some consider to be a low-level toxin. Lectins provide a built-in defense mechanism that triggers a negative reaction in predators, aiding in their survival. Lectins in plants are a defense against microorganisms, pests and insects. They may also have evolved as a way for seeds to remain intact as they passed through animals’ digestive systems, for later dispersal. Lectins are resistant to human digestion and they enter the blood unchanged. The ‘stickiness’ of lectins makes them prone to attaching to your intestinal wall. 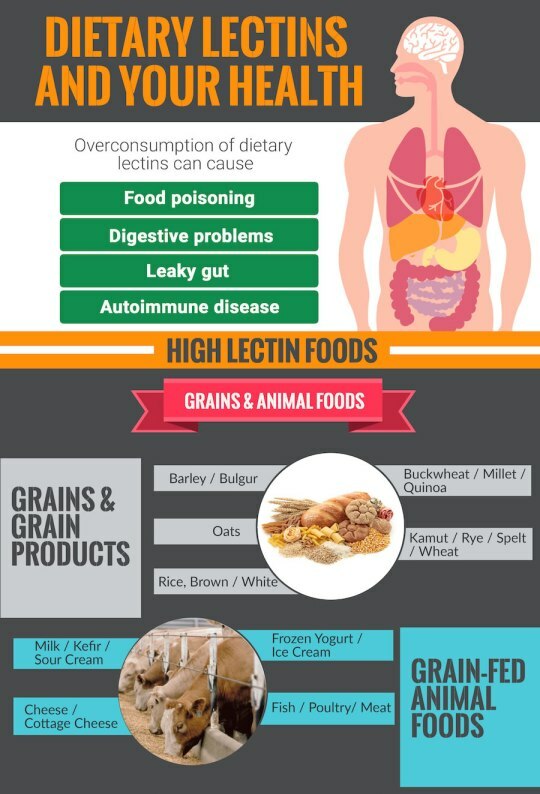 This is the main reason why excessive lectin intake causes digestive distress. High levels of lectins are found in beans, grains and legumes, as well as dairy and vegetables within the nightshade family. Many other foods contain lectins, at lower and less potentially toxic amounts. Milk with casein A1. Casein A2 is the normal protein in milk, present in milk from buffalo, goats, sheep and some Jersey cows. Unfortunately, most cows today are casein A1 producers, and the majority of store-bought milk is A1, even if it’s organic. A1 proteins are metabolized in your gut to make beta-casomorphin, which can attach to beta cells in your pancreas and incite an autoimmune attack. Proper soaking and cooking of grains and legumes reduces the lectins, and limiting nightshade vegetables helps too. Buying raw milk from Jersey cows and other animals is another way to limit lectins. Eating only grass-fed, pastured meats and all the tips I have just mentioned are all eating habits I promote anyway. 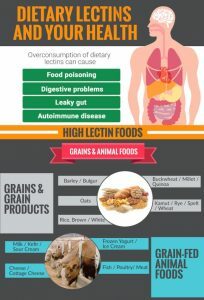 As I said if you already eat quality foods and a Paleo type diet you really don’t have to worry so much about lectins.